Over the last few weeks I have been popping in on a contractor we have had working on the Furth Stream…a tributary of the Umgeni. He is finished now. He was clearing logs out of this stream, so that we can fish it, and he was paid to do that by an environmental crowd, who shall go nameless for fear that they think I misrepresent them. They are a great bunch, but they go all silent when you talk about clearing a stream for trout fishing. They aren’t allowed to get excited about that, you see. Alien bla bla. The thing is, the guys on the ground know that if they go one step further than clearing alien vegetation in the valley (which they have already done admirably), and make this stream fishable, they suddenly get a bunch of us fly fishers who go all gooey eyed about our precious stream, and reach into our wallets to look after it. This all goes by fancy names like “Eco System services” and “Natural Capital accounting, and fills conference rooms for days on end. But rather than attend such a boring conference, consider the Furth Stream, and the anticipation of fishing it. I have started, furtively, calling it the #dreamstream. That’s because for now, at least, it is a dream. But watch this space. In the last month, we have had great rains here in the midlands of KZN. So, every time I have visited, the stream has been full and rushing. Sometimes a little off colour, but most times clean. The top 1.5kms of the stream is now clear of logs. The rushing water will have brought fish up from the main river some 2 kms away. The balance of the logs will be cleared over the next 2 months in a separate contract, and the regrowth wattle in the valley is being sprayed. I am allowed to fish this stream. You are not (for now). Tough! #dreamstream. A tributary that you CAN fish, and which is also full of fish that have come up from the main river, is one that flows into the Bushmans. I have been threatened a beating if I disclose its identity, and the person in question is bigger than me. But you have Google earth and an imagination, so there is no need to #dream….just go find it and get out there. 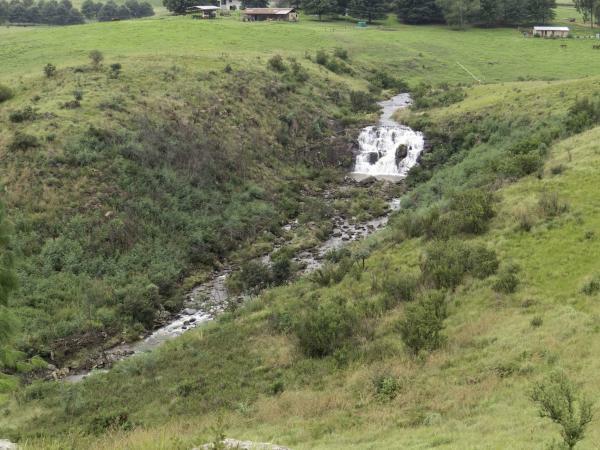 On the subject of tributaries: I get a sense that us fly-fishermen in KZN are not bold enough in our exploration of tributaries. I have just returned from a fishing trip where we fished for Rainbows in tributaries no wider than your bath tub, that ran dry less than 4 years ago. They are now full of fish, that have come up from the main river. The guys in that neck of the woods seem to get a kick out of boldly demonstrating where trout go, by catching them in the smallest tributaries they can find, and then nonchalantly brushing the episode off as “naturally…of course” with as little fanfare as they can. It makes them look cool beyond the most Tatooed, foul-mouthed model from the Mission fly mag! I plan on crawling up some noodly little ribbons of water before the season is done. If I succeed expect loads of self-congratulatory nonchalance and strutting! As for stillwaters: I have absolutely no idea whatsoever. I have had 16 full days out on the water so far this year, and every single one has been on a stream. 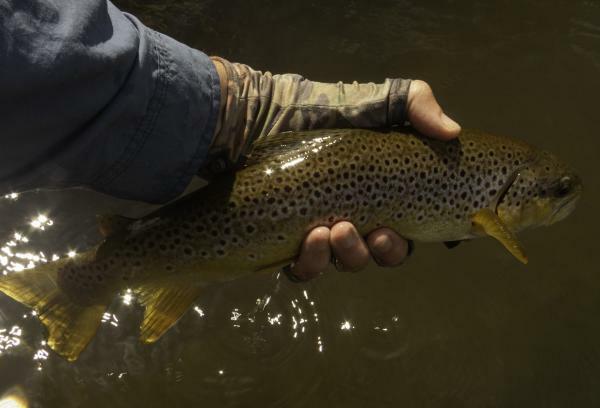 I have had browns of up to 18 inches on dry flies on the Mooi. I have had a blast with a hopper on the Thandabantu beat of the Bushmans. 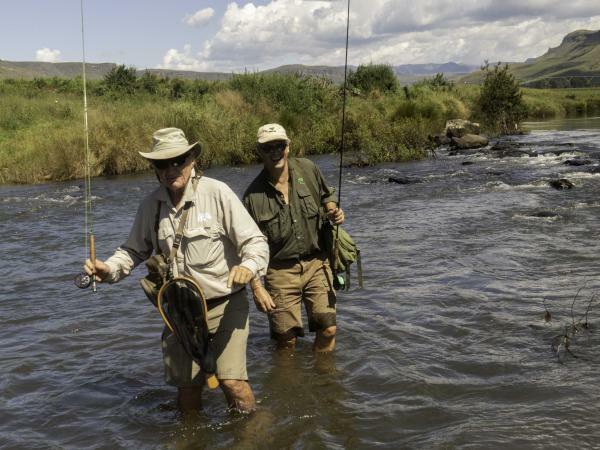 I caught about 10 fish in 80 metres on the Mooi on another occasion, and had success with a size 18 GRHE tied just behind a dry fly. That last occasion is worth mentioning. I arrived at a pool where the trout were rising, and I was about to throw my dry fly, when I considered for a moment, that they were not actually taking off the top. They were swirling just below the surface. So on a whim, I tied about 10 inches of 7X tippet to the back of my Klinkhamer, and lashed that little unweighted GRHE on the end. Voila! 5 fish, and a lot of fun. Someone else who had a lot of fun the other day, was a Viking who had escaped from a mental asylum. We had all stopped fishing and were sitting on the veranda of a cottage, sheltering from the rain, while he was out there in his technicoloured woolen crazy-hat, getting wet. The fishing had been terrible. We weren’t catching anything, and it was cold. Presently he emerged from the riverside brush, with a big grin on his face, wet to the core, few words, no photos, and his hands spread yeah-far apart in front of him. There’s a lesson in that. I’ve got to get me one of those hats!